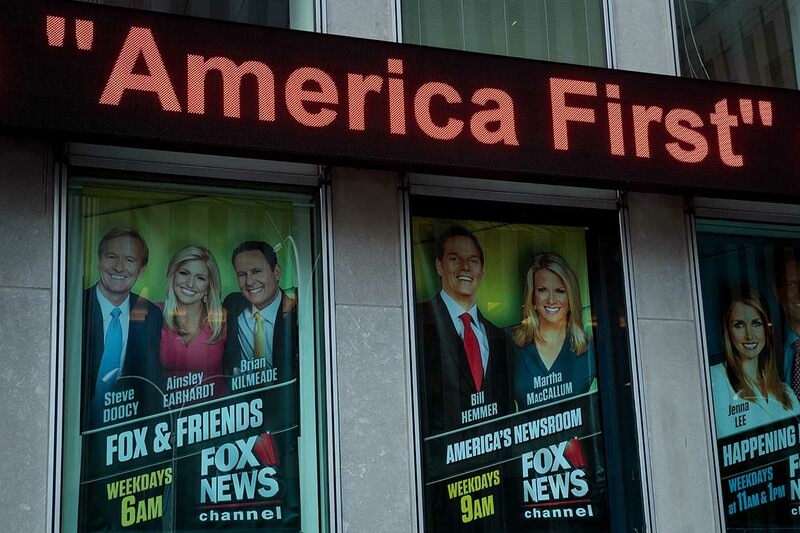 NEW YORK – Fox News Channel announced on Tuesday that it was disciplining employees involved in an email exchange with an assistant to former Trump's President and CEO, Scott Pruitt, in an effort to conduct an interview with Fox & Friends "with the head of the environment last year. The emails showed one of Pruitt's assistants suggesting the interview, sending "talking points" and giving a Fox producer a chance to approve a script to introduce Pruitt. The messages were discovered following a request from the Sierra Club's Freedom of Information Act and reported for the first time by the Daily Beast. This is another example of how close Fox News is to the Trump administration, where the president's director of communications is a former Fox executive. Fox's most popular personality, Sean Hannity, appeared on the Trump rally shortly before the mid-term elections. Fox would not say who was being punished, noting that it was a matter of staff and what this discipline involved. Previously, the network had stated that "this is not a standard practice and that the issue is handled internally with the people involved". In May 2017, Amy Graham, former representative of the Environmental Protection Agency, wrote to Fox telling him that Pruitt would be in New York and could go to Fox's studio to talk about Pruitt's reforms to help communities. poorly served by the administration of President Barack Obama. "Pruitt has been bluntly voiced on the lack of environmental achievements under the Obama administration, calling President Obama a" non-savior of the environment "and would like to develop these comments, "said Graham. Fox & Friends producer Andrew Murray accepted the interview. When Graham responded by reminding us that "we really had to stick to this" and that we needed confirmation, that would be the case, Murray agreed. He attributed the segment to another producer, Diana Aloi. Your guide to the media circus – the mornings of the week, in your inbox. Pruitt resigned 14 months after the interview, after a series of stories about breaches of ethics, including excessive spending for travel and security, trying to find a job for his wife and bypassing the White House to get pay raises for his best aides. Aloi asked for "bullet points" about what Pruitt would like to discuss and Graham responded with several. Later, Aloi sent him a four-paragraph introductory script, asking him: "Would this be appropriate for the configuration of the segment?" The script spoke of a new direction to be taken for the EPA "after the Obama administration left behind a huge toxic mess." More than 1,300 heavily contaminated Superfund sites still need to be cleaned up. So, why was President Obama presented as a savior of the environment if all these problems still exist? " It is not uncommon for journalists and news reporters to talk in advance about topics that can be interviewed. Promises of not addressing certain topics are considered illegible by most journalists, with the approval of the scenario being an even greater moral failure. When Pruitt came out the next day, Brian Kilmeade, host of "Fox & Friends," said, "President Trump is doing his best to drain the swamp and much of this drying up has taken place at the Environmental Protection Agency. after the Obama administration has left behind … huge toxic damage. " Ainsley Earhardt, the host, added: "More than 1,300 Superfund sites, heavily contaminated, still need to be cleaned up." Third moderator, Steve Doocy, told Pruitt: "The press has made President Obama the savior of the environment and yet, when you look at the number of toxic dumps left on your plate, it's a important figure. " In his testimony before Congress earlier this year, Pruitt said that Trump's EPA in 2017 had eliminated more polluted sites across the country than the previous administration had had in the past year. former. The EPA said seven cleanups of Superfund sites were completed in 2017, compared to two in 2016. Yet, records have shown that construction work on these seven sites was completed years before Pruitt became head of the company. EPA in February 2017. Earhardt said at one point in the interview that "we're talking about memos and what's going on in the White House. That's what the American public really needs to focus on, right? Jobs, our personal safety, protect our children from cancer. " She was not exactly talking about what she was referring to, although the day of the interview, an important narrative talks about a memo that former FBI director James Comey had writes about Trump asking him to stop an investigation into former National Security Advisor Michael Flynn. Kilmeade ended the interview with a question that had not been addressed during the arrangement, about the Trump administration and its views on the Paris agreement on climate change.